Telling someone you know how to paint Space Wolves can be a mighty big claim. While there may be only a dozen or so great wolf companies, there's got to be ten times as many ways to paint them. 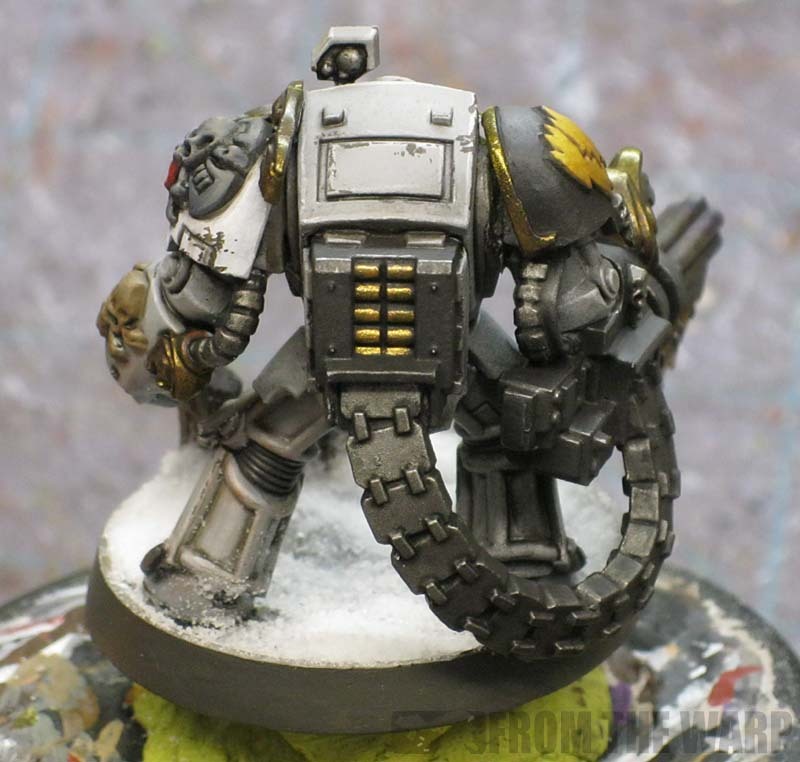 In this case, I went with the Forge World look or the pale, light grey look. I kept away from the blue tint and went just for the grey. It feels like it's a bit more imposing than the blue tinted armour to me. That being said, here's the quick and dirty process I used to get the results you see there. I've primed this guy using a light grey color. Actually it's the exact color of my basecoat too. I have this color in spray (for priming) and in a pot (for touch up work). I decided this was going to be the color for my armour. It would save me lots of work in the end by doing this. How did I end up with an assault cannon toting terminator? This is how he came to me. My friend was kind enough to donate him to the cause. I did however put him on a Secret Weapon base so that I could load it up with snow so he fits in with the Imperial Armour 11 theme. I even painted him up as part of Red Branmaw's Great Company although I'm not so sure I got it right. 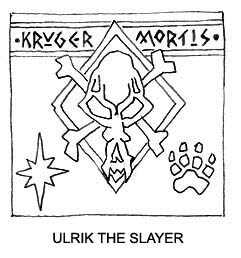 I hope I don't offend any Space Wolf players out there with my feeble attempt. Come to think of it, I'm not sure the base with the blasted tree stumps matches the world in IA11 either. Nonetheless, I've been looking for an excuse to use this base and that's what I'm going with. Blasted tree stumps are cool looking and snow makes everything better. The shadng on this guy was done again with the Soft Body Black wash from Secret Weapon Minis. I normally use GW washes for most of my shading, but since it worked so well on white with my White Scar model, I decided to try it again to see how it would fare over light grey. If I were painting this guy a few months ago, I would have used a thinned wash of say GW Adeptus Battlegrey for the shading. Just goes to show you that you should always be trying new things and techniques. The SWM wash did the job perfectly. Again, no shaking the bottle before using it though. I didn't thin it either. The only thing I needed to do was keep an eye on pooling since I applied it liberally over the whole model. When it came to highlighting, I did go back over some of the upper faces of the armour plates with my basecolor again to clean it up. Not much though. My only highlight is a line highlight on the upper edges as well using thinned GW Skull White. That's it, armour is done! At this point, it was just a matter of adding the details. If you look carefully at his shoulderpad and the assault cannon, you can see those are highlighted differently. I used a zenithal approach and wet blended the highlight into the black. I think it gives the model a much better look. You could do a simple line highlight here as well and save a little bit of work. When it came time to paint some of the other elements. I sort of went by what looked good. The crux on his left shoulder is highlighted a few times alternating between cool and warm greys to get it to stand out against his armour. 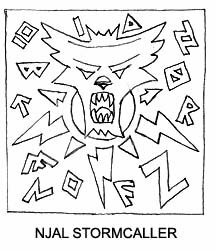 The yellow wolf head on his right shoulder was another element I wanted to stand out, but only so much. With the shoulderpad painted first,I started on the icon second. I gave it a basecoat of GW Foundation Calthan Brown before going over it with GW Foundation Iyanden Darksun. Since this was going to be too bright, I hit it with a few passes of GW Gryphonne Sepia wash until it darkened down to my liking. Using the Darksun color, I touched up the upper edges of the wolf head as a final step. The gun barrels were given the heat stained look and the battle damage was kept smaller in scale. I wanted to see if I could get it better and maybe more realistic looking. Sometimes I think I'm too heavy handed in my application and I'm trying to cut back some. Doing battle damage over lighter colored armour makes you slow down and take your time. The basing was simple enough. All I did was give the whole thing a quick wash of black and then covered it completely with snow. I'm using GF9 snow and regular white (PVA) glue. I'd add a layer, give it time to dry, add another layer, give it time to dry and then I think I did one more layer of snow for the deep areas. I need to work on my snow some more. It looks ok, but I'd like to have a little more control over it. All in all, he was a quick paint job and the weathering brought him to life in the end. I like the snow effect, it gives him a certain feel. Then again, snow bases tend to do that. I think if I were to do something different, it might be to try a thinned blue wash in the beginning to give the armour a different and more traditional Space Wolf look. I wonder how that would turn out. These are also posted on the Downloads and Banners page with lots of other banners. 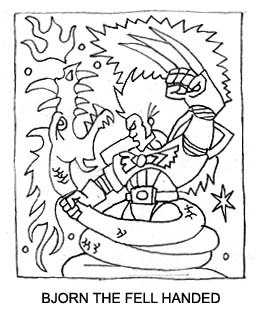 I've only got a few character banners right now, but as I get time, I'll add more as I get them drawn up. here is the primer and basecolor I used. It's the two on the left. The spray primer is by ColorPlace and is called "Grey Primer" I believe. The bottle color that matches it exactly is Slate Grey by Americana. Army Undecided tried this very technique out with his wolves. Wolfen: It is on the light end of the spectrum. Like I said, there are a thousand ways if not more to paint Wolves. I just wanted to try this one. I'm thinking about doing it again to see what it looks like if I add a little blue to it like Space Wolf armour traditionally has. Great article. I really enjoyed the walk through of your steps on how to get good shading and highlighting on white. Nice article, Ron. 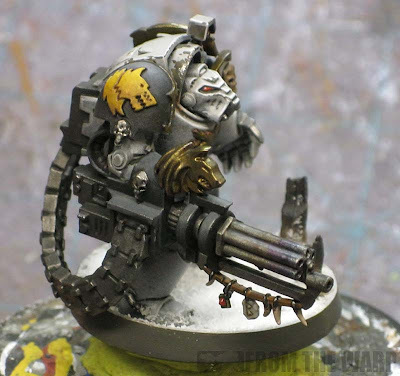 What is the spray you used for the grey? I am curious to try this myself on a few projects. I love me some speed painting, please follow up with How to Paint an entire Deathwing Force Quickly. Or at least try this on one bone white Deathwing model. I'm so glad to see someone finally use the "Blasted Wetlands" bases to set a winter scene -- this is how I'm doing my Khador army and I haven't gotten to the basing yet. This is an incredible tutorial and, once again, I'm blown away by what you can accomplish with such speed and ease. Fayte: It might look white, but in reality it's more of a grey color. I can see how differences in monitors might make the color appear to be different. I got that with my bone color too. I'd hate to push the colors on the picture to make it obvious because it would alter everything else so much as well. Jeff H.: I've added it to the very bottom of the post Sir. Hope that helps! SC John: Deathwing is doable, I just need to find the perfect color combination to make it a "speed" painting technique. I'll see what I can dig up. That and the blue is something I want to try out... a more classic look to the armour. misterjustin: I told you I liked the blasted stumps when I first saw them and that I thought they looked super cool. I've been waiting to use that very base. Ron: That grey primer you use looks to be the exact same shade of grey as the Tamiya Light Grey Primer I use. Quick but effective paint job, very nice work once again mate. SC John: You could try to find a matt spray undercoat that is fairly close to Bleached Bone (e.g. Army Painter Skeleton Bone or equivalent), then wash with a Sepia toned glaze (perhaps SW Parchment Wash or thinned GW Gryphonne Sepia), then highlight with 50:50 Bleached Bone:Skull White (or equivalents from your preferred paint brand). Headologist: Secret Weapon makes a line of washes that while I don't use them for everything, I use them in a few places and I'll use nothing else to get that effect. They have certain properties I can't match with other washes and so they have a firm spot on my desk for creating specific effects. This is a great article, with clear to follow steps. 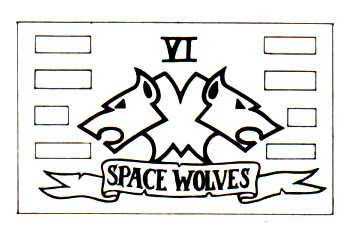 I have already sent the link to my Space Wolf playing friends! Forgive me for asking redundant question (not quite good at english...sorry.) I'm not sure if I got your meaning right. Have you applied wash on everywhere on model as whole, not just recess areas like you did before on White Scar? Beautiful work. I really admire it. Throatpuck: Thanks for spreading it around! Anon: It's not redundant, it's a good question actually. I did apply the wash all over in this case so it darkened the whole model ever so slightly and then mainly collected in the recessed areas. The Whiter Scar model was more controlled since I was working the armour back up to a clean white. Here I wanted it to be a little darker and more "grey" so I washed the whole thing. I like the color scheme on the Terminator a lot. It does look a little more serious than a blue would(imo). cheers! Nice tutorial. 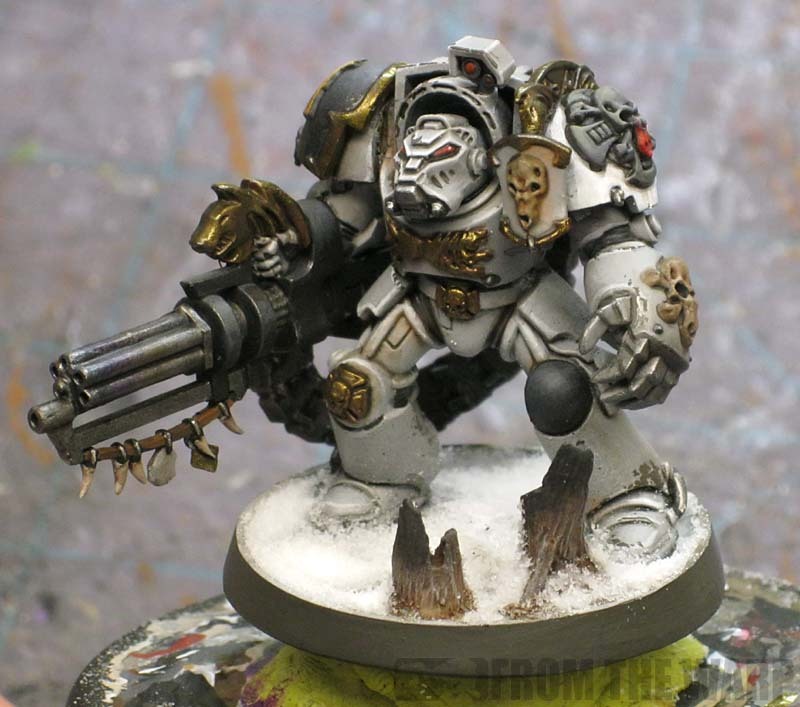 Its a deathwing terminator with Space wolves insignia and ornaments. General: The blue tint is a classic look though. They both have their merits, I just happen to think the non-blue is bit more military looking myself. Trying to benchmark your method here, but the wash gets applied too dark (not so grey as it should be) and dirty (some parts get black, other parts get dotted more grey-ish). Maybe I should try to use bigger brush so I could make less brushing, thus have some consistency on application. Anon: I slightly larger brush might help. I tend to load up my brush with enough wash so that I only have to dab it onto the surface and I do very little "brushing." Sometimes it will pool as gravity pulls on it and the wash will really collect in some places. A slightly damp brush touched to the surface of the pooled wash will wick it away... just make sure you get to it as soon as you see it so it doesn't leave a watermark on the surface. First, I would like to say that it looks great! I would really like to add that you amaze me with the fact you use brands like ceramacoat/apple barrel/Americana acrylic paints! I started off using these when I first got into this hobby. Now I have a full set of GW and Vallejo Game Color (though I mainly use the Vallejo these days) but seeing your blog posts has really got me reconsidering going back to the cheaper stuff since you get so much and the stuff is dirt cheap (less than $1 at my local Michaels store). I do like the GW washes, though I have been trying other homebrew recipes as well (mainly les's recipes and oil paint washes). I still have like 30+ cheap acrylic paints which I gave to my fiance, I think in the near future I am going to give them another chance to see what I can accomplish now that I have some experience in painting. Awesome job though! I'm trying it out, so far it's working great! I liked the scheme so much I ordered models to fill out an 1850 Space Wolf army. It's going to look freakin' sweet. If your looking for a better method to making realistic snow for your bases try out the Baking Soda method if you haven't tried it out yet. Yes the same 99 cent Baking Soda you can get from WalMart. You just mix it with PVA Glue (I use good old Elmers Glue) and a small amount of water and mix it to the consistency of a milkshake. Then you slap it on the base then as it dries you sprinkle more Baking Soda onto it and TADA! realistic snow. It does take some practice to get the right consistency you want. Not much though. Hope that helps! NeoBiggs: Sorry for the delayed reply... I thought I'd seen your comment and answered. I'm not a big person on using a particular brand of paint exclusively. I really do use whatever color I need from whatever brand makes it. I think that's come from not wanting to mix colors. Ultimately, I've found the cheap stuff to work just as well as the expensive stuff in most cases. If you want an absolute exact color though, you may have to buy the one brand it comes from. Sen: We've been talking about your Wolves and they do look great! Kevin: There are tons of ways to make snow out there. It comes down to the look you want on your model... puffy snow, wet, dry, powdery, etc. I think snow is one of those things you should experiment with until you find the method that gets the results you want. Amazing stuff, I actually went out and bought the grey primer and slate grey paints today...kinda nice when you don't have to spend $20+ to paint half an army when you spend $10 to paint it all! Chris: Excellent! The weathering is done with a brush and it's a few patches of GW Charadon Granite followed by GW Boltgun Metal inside that to show the few areas that have been rubbed down to the metal. Hey Ron, one other question...how did you paint your tree stumps? Chris: They are based with a dark brown color and drybrushed with a light brown/tan color to bring out the texture. The black is drybrushed on the tops and then a wash of thinned black paint is added to that area to fill in the recessed areas since you want the whole area blackened and not just the raised surfaces. If you're feeling super ambitious, you can hit the top of the black area with a medium grey color drybrush to bring out some surface texture in that area. Looks amazing, I am quite new when it comes to painting and I just bought 1500 points of space wolves, If I did want a more light blue scheme can I use this method or should the primer always be white-ish or black? Eric: If you wanted a more light-blue method, you might try shading with a different color wash. Something with a blue tint to it. 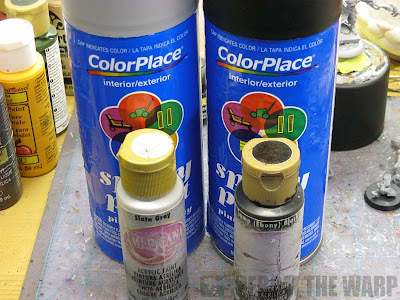 The color of your primer will affect how easy or hard it will be to get good, smooth color base coats on your model. If your model is light colored, it's sometimes easier to prime with a light color so you need fewer coats to get good coverage. Same goes for black primer, with a darker colored model, the black helps create the shadows and such. 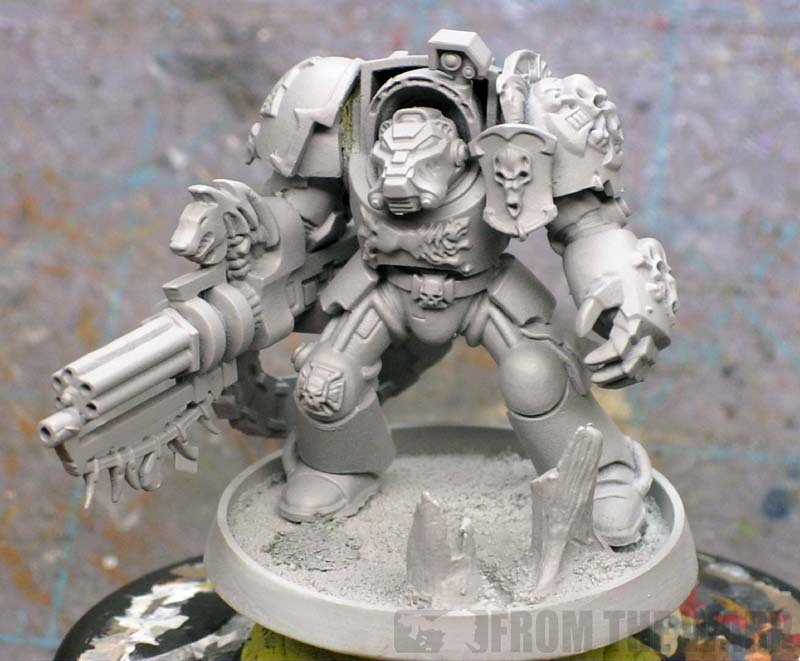 Take a look at these posts for some more thoughts on priming models, they might get you started. Great article, just what I was looking for with my space wolves. 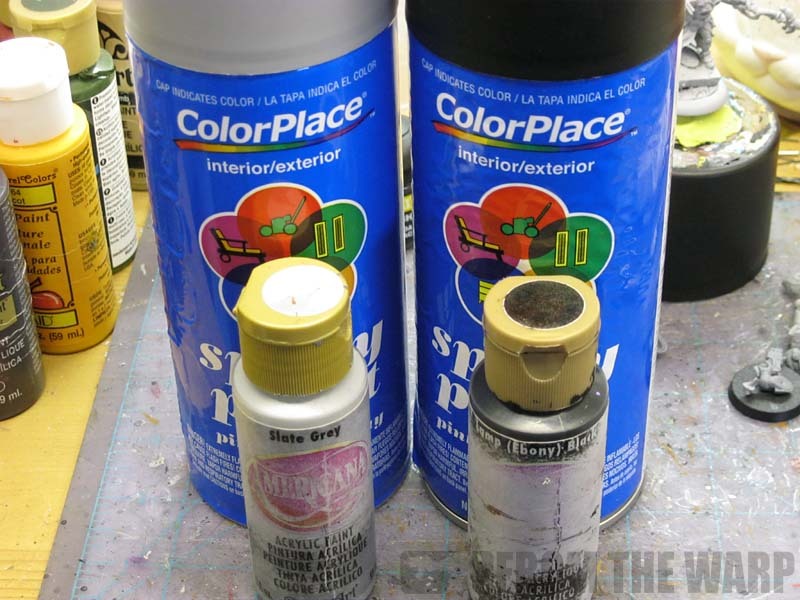 I have one problem tho, it's cheaper and convenient for me to use Vallejo, p3 and GW paints, so I was wondering if you had any recommendations for substitutes on the grey basecoat? Anon: Thanks. When it comes down to it, you could use any grey color really. It all depends on the final look you want. it might take some experimenting to see what certain base colors do under the wash, but I suspect you wouldn't have any troubles with any other colors. I finally finished an army using this method. Thanks again, it made it much easier and I really like it. Check out the final pictures. Sean: Those look great! I'm glad to hear that it worked so well for you. It's one thing to see a single mini painted up like this, but your shots of the whole force make it all the more imposing. 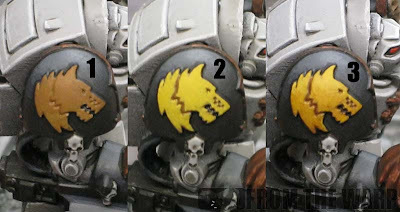 As a dire hard Dark Angels fan, I don't know that I could ever play Wolves, but after seeing how you made your force look, I'd use this method for sure now. I can't get these colorplace sprays in the UK.. I really wanna use this method can anyone recommend a good alternative that I can get hold of? Phil Salter: You could use just about any light color grey you wanted in this case. The trick is the Secret Weapon wash over it that makes it easy to shade. Find a light grey that you like and go with that. Excellent job on this guy. I've recently decided to Collect an army of Space Wolves. I prefer this paint scheme to the standard Blue/Grey. I picked up a Wolves Term squad the other day as my first squad. I was suprised by the amount of detail on the squad, it also looks as if they have put some thought into where they inject the plastic. Now i'm browsing for bases while i prepare them for painting. Thanks. The blue-grey color is cool, but I like the grey without the blue in it. It feels a bit more militaristic to me and not so much cartoony if that makes sense. Ron that is an awesome paint scheme you have there! 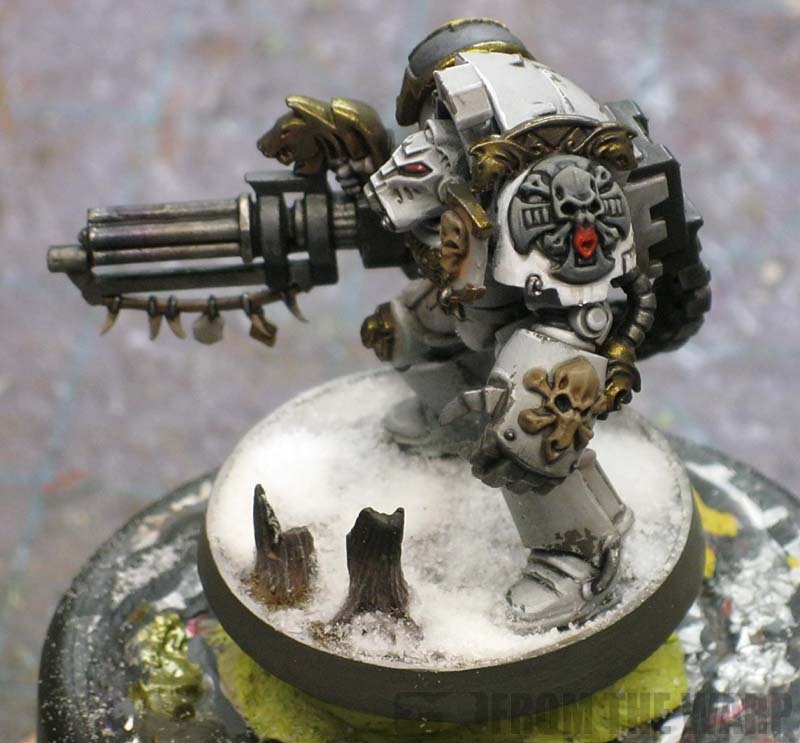 What I don't understand, (or can't do) is get the armor the color I like, I use GW paints, and I have used the spray paint you said to use, but it seems it always come out to bright, and white. Any suggestions? Thanks! I'm not sure why the scheme is coming out so bright if you're using the same colors and technique. You might try washing the whole model again with the SWM was in order to darken it down slightly (even more). 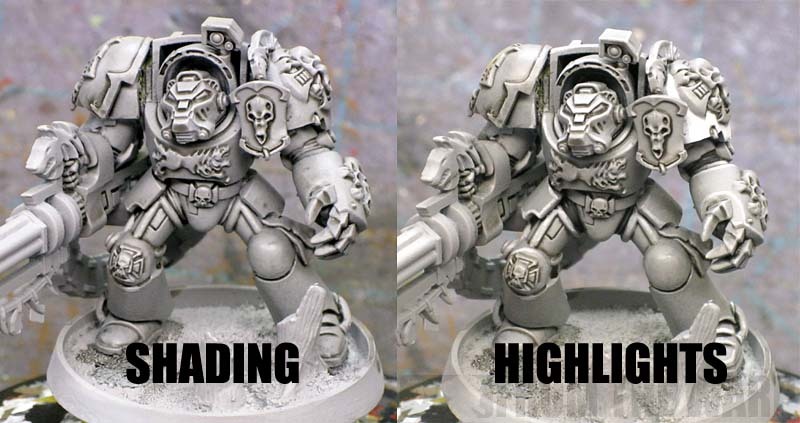 If it's still too light, you could opt to use a slightly darker color for the armour. Either a dark grey spray paint or even a brush on paint that gives you the color you like. There's some flexibility with the colors, just keep in mind that the shading on this model works like it does because of the light color to the armour. Make it much darker and you might have to make two passes or use a different shading technique.